Once upon a time (it was actually just the other day! ), I found myself in a situation. A dilemma. A quandary, even. 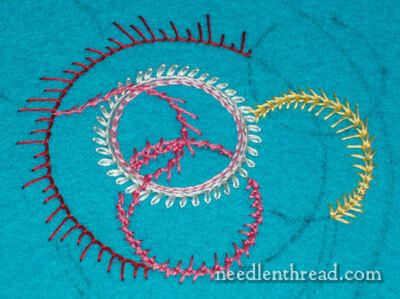 I was in need of a small embroidered demonstration piece – just a tiny embroidered circle, to illustrate that pendant chain stitch (video coming up later this week) can be worked very effectively around a circle. And my need was exacerbated by the fact that I wasn’t in a stitching situation. I didn’t have a choice of supplies at hand – nothing at all like the supplies I had in mind for my little circle. But golly, all I needed was a little circle! Just ten minutes of stitching, and I could have the thing done. Add that to the fact that I was sitting, and waiting, and sitting and waiting… in one of those “sitting and waiting” Circumstances of Life. 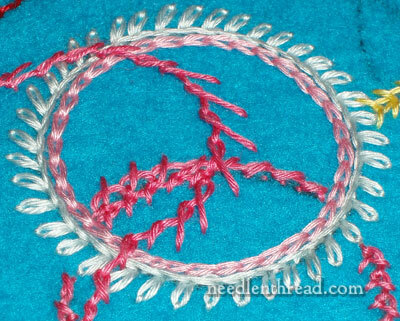 My mind kept wandering back to the pendant chain stitch around a small circle, and in my head, I was stitching it. It so happened that I had a small selection of stitching supplies on hand. They weren’t gathered together for any project. They were odds and ends that I was transporting to share with someone else. They were there. They were in the car! I could use them, couldn’t I? Necessity is the mother of invention, to be cliché-ish, and surely this was the case. In my pen case from school, I had a black pen and a broken protractor. In the odds and ends bag in the car, I had a piece of turquoise felt (oh my) and the new colors of floche that I was taking to show my students. Oh double-my. Not exactly my color combinations in regular circumstances. But I doubted I had a needle. Oh bother! Really, there are some things that can be accomplished, stitching-wise, without tools. Threads can be cut without scissors. Fabric can be held taut without a hoop. Projects can be seen without ideal lighting. We all know this. We’ve all stitched with bare necessities before. But to stitch without a needle? I wasn’t quite sure how to meet that challenge. Now, I would love to be able to tell you that I met the challenge – that I managed some MacGyver-type heroics and rigged a needle out of the most unlikely materials and stitched the pendant chain circle and more besides! But I think I’ll stick a bit closer to reality. There’s nothing I find more irritating than coming across a Surprise Needle stuck in a piece of fabric. You grab the corner, and —- arrrrgh. Right in the hand. But you know, sometimes the prick of a needle can be a welcomed thing. I did get the pendant chain circle stitched (and more besides), and though the piece is not much more than embroidered chaos, I was happy! It’s time to buy a new protractor. Just goes to show that we should occasionally keep our needles in places other than the needlebook! And I love your circles, also I am looking forward to the pendant chain stitch as I am working on circles on a small quilt. Great fun to read you. Looking forward to the next video…. The colors may not be your normal choices, not sure I would have chosen them either, but they do look good together. I think I need to keep something in the car for those occasions when I’m unexpectedly waiting. It certainly would beat sitting there grumbling about waiting. What a happy combination of colors! I rather like this impromptu piece. Don’t you just hate those “sitting and waiting” situations? Luckily you had supplies with you. I think I will put together a package of needlework to keep in the car for just those situations. I sort of like the color combination. I also bought all the new floche colors and promptly put them away. 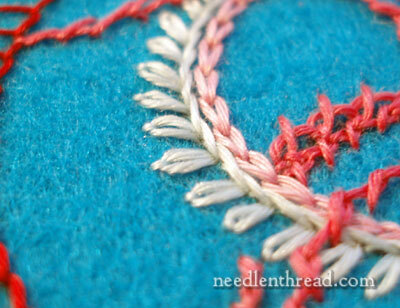 I really have to try out that pendant chain stitch, I like it! This and a recent other submission from you (on the “smoothing/laying” tool), reminds me that like any other endeavor, the end product will be the result of having the proper tools and materials….like baking a cake? ) ….. ergo…I guess it’s time to go out and buy the compass and protractor which my 4th grade teacher told me I would someday absolutely need !…dontcha hate it when they’re right !! :-)…Judy in Pittsburgh ! LOL! Thanks, Judy. Come to think of it, my math teachers were right about a lot of things. They used to say things like, “You’ll need this when you get out of school.” And I used to think, “Yeah. Right.” And while I may never have used a calculus equation since leaving school (and I actually never intend to, but don’t tell them I said that! ), it is true that algebra and geometry (and basic math, of course) have all come in handy! Yes. Time to get the protractor! This does look like fun for those times you haven’t either the time or patience to get into serious embroidery. could you please tell me what stitch the pink rope like one that goes across the page on picture 4. I can look i up once I know the name. WOW!!! I just love your website! It really surprised me when I found out how many people actually embroider as a hobby.When you talk, (type)it’s always soooo interesting because of the wonderful words you use. I mean,exacerbated? Awesome!!! ‘Exacerbate’ is one of my favourite words and it is so nice to find someone else who knows what it means. It seems to me that it is time not only to buy the new protractor, but to put together a small kit so that those inevitable and wasteful ‘sitting and waiting’ circumstances aren’t so wasteful. Oops, sorry, I meant to ask (and please excuse my ignorance but I do live on the other side of the pond) who is ‘McGyver’?